White House spokesman Sean Spicer holds a press briefing at the White House in Washington, Jan. 23, 2017. WHITE HOUSE,17 March,2017: Steve Herman became VOA’s White House bureau chief in March after spending 25 years as a foreign correspondent. His previous post required Herman to travel often throughout the world. Now he reports from a small booth on the world’s biggest political stories. Here are his initial impressions of day-to-day work as a White House correspondent. The “mushroom method” refers to keeping reporters in the dark and feeding them manure. Throughout many presidential administrations, reporters assigned to the basement by the West Wing have frequently complained of being treated like mushrooms. Philomena Jurey, who covered Presidents Richard Nixon, Gerald Ford, Jimmy Carter and Ronald Reagan for VOA, titled her autobiography A Basement Seat to History. Others have compared their plight to prisoners in cramped, overcrowded quarters. 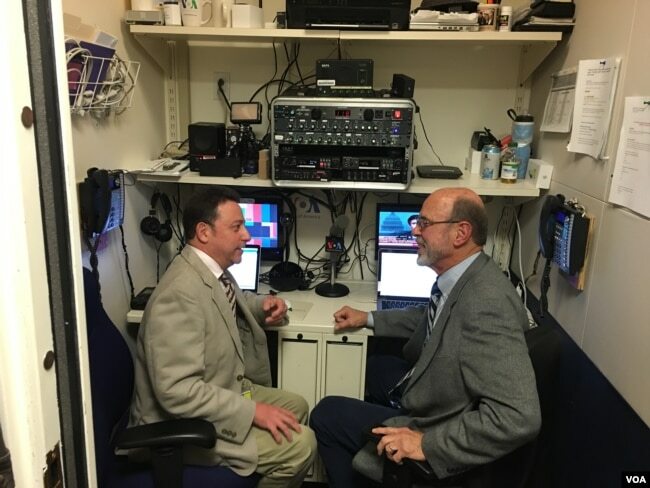 White House bureau chief Steve Herman (left) and senior correspondent Peter Heinlein discussing the day’s assignments in the small VOA studio in the basement of the West Wing. Once cleared through the northwest gate, the roaming ground for White House correspondents is quite limited with infrequent exceptions. The reporters can meander unescorted through the two narrow floors encompassing the press briefing room. Down one floor, the basement booths and desks are where VOA and a dozen or so other news outlets maintain their White House bureaus. 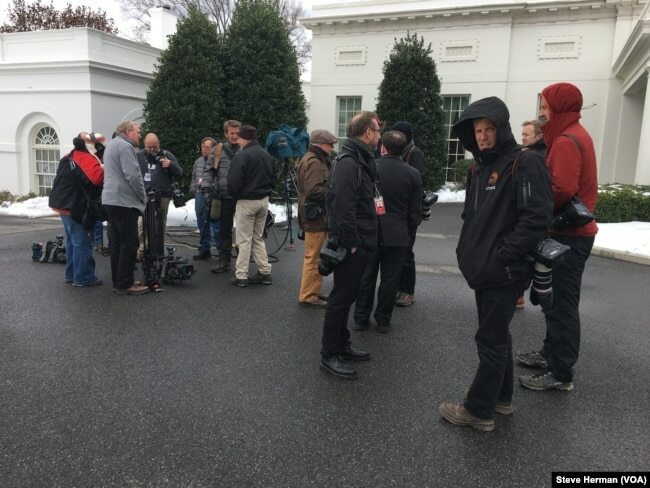 The only outdoor space not off limits is between the so-called “Palm Room” doors and the winding driveway from the West Wing entrance to an area of the North Lawn where TV reporters’ stand-up positions are known as “Pebble Beach” (once covered with gravel, but now asphalt). Presidential departures and arrivals via Marine One are generally open to all media with White House passes and credentials. That allows escorted trips to the South Lawn, which doubles as a landing pad for the presidential helicopter. The events are an opportunity for reporters to shout questions at the arriving or departing president who can feign hearing difficulties due to the noisy aircraft engines. Members of a White House press pool waiting outside the West Wing on a chilly day. There may also be glimpses of the president entering or exiting the Oval Office. No more than a small designated pack of media ever assemble in the president’s famed Oval Office at any one time. This group is known as a “pool,” which shares its video, audio or notes with other non-attendees who toil for outlets on the rotating list of pool duty. VOA finds itself on in-town pool duty, on average, twice a month. That means standing by for long hours of waiting for something (or nothing) to happen and then hearing a squawk over the loudspeakers to quickly assemble at the Palm Room doors. These days the book is usually replaced with distracted scrolling through one’s Twitter feed. The most familiar scene involving reporters and the White House is the briefing by the press secretary. In previous administrations, there was a tradition of calling first on a front-row senior wire service reporter (AP nowadays, UPI in decades past). The White House Correspondents’ Associates controls the press room seating arrangements, but the White House, itself, determines which individuals receive credentials to enter and line the aisles. 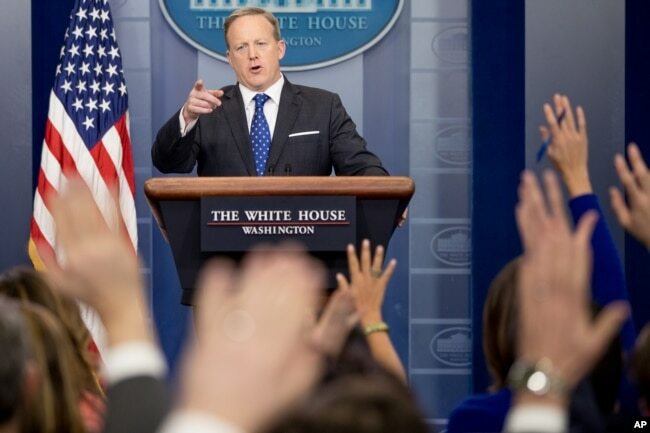 FILE – White House press secretary Sean Spicer takes a question from a member of the media during the daily press briefing at the White House in Washington, Feb. 21, 2017. VOA has had a full-time presence in the White House press for many decades and occupies a fourth-row permanent seat between National Journal and Fox News Radio in the briefing room. Press Secretary Sean Spicer, much to the chagrin of the major media outlets, gives less priority to the wires and TV network journalists, instead pointing his finger over them to other reporters, including those on the sidelines. This includes those from entities so obscure that a Google search for their bylines yields no results. Some reporters who ask questions at the daily briefings are not even in the room – they are the rotating recipients of the new “Skype seats” – their video images beamed in behind the press secretary, who has selected them in advance from across the country. The interchange between the briefer and the questioners, in every administration, has been testy at times. The reporters and Spicer quickly became material for parodies on television comedy shows, most notably NBC’s Saturday Night Live, where actress Melissa McCarthy portrays an unhinged Spicer ramming reporters with his lectern. Life threatens to imitate art. Behind the scenes in the press room, it has been less jocular. Tempers have frayed over the White House’s decision to credential commentators from far-right online websites, including those accused of supporting white nationalism and trafficking in conspiracies. 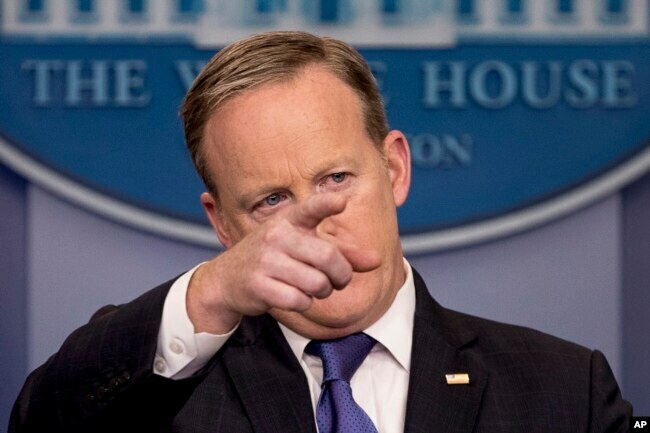 White House Press Secretary Sean Spicer calls on a member of the media during the daily press briefing at the White House in Washington, March 13, 2017. One such figure has commented publicly that he was in the press room primarily to dig up dirt on the established White House correspondents. The grizzled standard-bearers of the mainstream media in the front row roll their eyes and mutter curses when Spicer points to the back of the room and calls on one of the so-called floaters – usually young Trump cheerleaders who will throw questions at Spicer with all the hardness of a beach ball. For the president’s supporters, the media’s criticism falls on deaf ears. Many of them are already critical of the mainstream media, so journalists’ complaints are taken as evidence the administration is following through on Trump’s attacks on the so-called “dishonest” media. This all puts the White House press room reporters in the spotlight, despite their best efforts to keep it beamed on the president and his players.